Size of Male: 45-65 lbs., 22-27 in. Size of Female: 45-54 lbs., 20-25 in. Color: Tri-colored – white, black and tan. White may be the predominant color with black marking and tan trim; or black may be the predominant color with white marking and tan trim, such as a saddle back or blanket back. The Treeing Walker Coonhound descends from the earliest English Foxhounds that were brought to America. These dogs were once known as English Coonhounds, but by 1945 were quite distinctive and breeders broke away to breed the qualities they desired. Today’s breed is a fast, sensible hunter able to find their quarry quickly. They have superior endurance and treeing abilities. The Treeing Walker Coonhound is intelligent, confident, and sociable with family and friends. The Treeing Walker Coonhound has a distinguished lineage, descending from the earliest English Foxhounds brought to America. 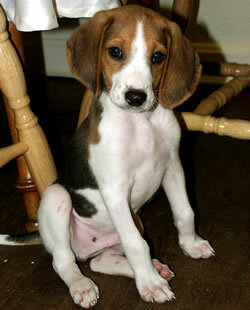 They were developed from the Walker Foxhound which, in turn, was developed from earlier Virginia Hounds. The Treeing Walker today still resembles the Walker Foxhound. It has the same color and conformation as those earlier hounds. They are sometimes described as a trailing hound with a treeing instinct. In terms of the way they work, the Treeing Walker is fast with a hot nose, but they are a sensible hunter. They have a clear, ringing bugle voice or they give a steady clear chop and make a changeover at the tree. They are able to find their quarry quickly and they have outstanding endurance and treeing ability. They range widely and they can leave the original track if they find a stronger scent. Their speed makes them extremely competitive and their reputation grew as night hunts gained in popularity. The Treeing Walker is an active, alert dog and they do require plenty of exercise. They are typically confident, loving, highly intelligent, and sociable dogs. They enjoy spending time with their families. While these dogs are great hunting dogs, with tremendous endurance and energy, at home they are mellow and they enjoy comfort. They will appreciate a comfortable dog bed or even enjoy lying on the sofa or your bed. Once one of these dogs is asleep in a favorite spot, you may have trouble waking him or making him move. They love to make a nest in a pile of pillows or blankets. They have a calm, even temperament and they get along very well with other dogs and with children. They can even learn to live in harmony with cats if they are introduced to them carefully. You should be warned that these dogs do tend to bark, as you would expect with a coonhound. They also have a natural tendency to stand up on their hind legs so they can reach many things up high that most other dogs can’t reach. These are very loving, sweet dogs and they make good pets, provided you have time to train them. They are very smart and they need owners who can spend time with them. Living Environment – While these are medium-large dogs, they enjoy spending as much time as possible with their families. They thrive on comfort, as long as they also have the opportunity to have plenty of regular exercise. Grooming – Treeing Walkers have minimal grooming requirements. They have a short, smooth coat that should be brushed regularly to remove dead hair, especially when they shed. Bathe as necessary. Diet & Exercise – The Treeing Walker has normal dietary needs, although, as a breed, they are particularly prone to leanness. They are not usually very food-motivated. There are some reports that Treeing Walkers can have an upset stomach from eating treats and things like rawhides and bones. The problems are said to cease when these treats are stopped. By nature they prefer to run freely and they like to run great distances. Once they catch a scent, they will be oblivious to commands. If you chase after the dog, he will simply run faster. A lost Treeing Walker Coonhound can be found 50 miles away from home in a short time. You should definitely not let your dog run off-leash unless you are in a very secure area with very high fences. An on-leash hike in different challenging settings would be welcome. Health – The Treeing Walker Coonhound has always been a performance-based breed. If dogs were good hunters, and healthy, they were bred. If not, they were not bred. At this time the breed doesn’t have any recommended health tests or provide any listing of health problems in the breed. However, with their long ears, you should be sure to check your dog’s ears regularly and keep them clean to make sure they stay clean. The Treeing Walker is an extremely intelligent dog and they like to please. They also learn by example. When you put all of this together, you have a very smart dog. You will need to be very consistent with training and start early. Many of these dogs learn lots of words and they can respond to something you say, even if you don’t intend for them to learn a word. They can learn some of your gestures when you don’t intend for them to do so. Sometimes they can try to negotiate to get you do to something they want you to do instead of what you ask them to do. They enjoy interacting with people, especially their owners, so if you spend time training your dog it can prevent him from getting bored and developing problem behaviors. Treeing Walkers will also move chairs so they can climb over things and use other objects to help them get something. They are really very smart! This highly intelligent breed prefers a range of different toys, from complex toys to things like chews. Get your dog toys that you can take apart or stuff with other toys or a toy that makes different sounds. They also like toys that test their intelligence, like the ones that have a treat inside. As intelligent, sensitive dogs, they do not do well with rough training.